Another impressive performance by the rising star that is Donte Dunn. He's now won five out of his last six matches, and looks like he's going to end 2017 on a roll! As for Akima Brave, he's now been beaten twice by Dunn, but the big Samoan looked good out there at times. He was dominant for most of the match really, but that 'Sunny Daze' spinning back fist hits you so hard, it doesn't matter who you are! Nobody kicks out of it! Aldous Blackfriar was in charge of Mutant here, and he ordered his heavyweight bodyguard around. Mutant toyed with the two local enhancement talents as if they were children, and he threw the much smaller men around. An impressive moment came when 'The King of the Wasteland' picked both of his opponents up onto his shoulders, and delivered a Samoan Drop to them both! He then tagged Aldous in, who kicked one guy out of the ring, and locked the other in his 'Batwing' finisher! A good debut for Sayeed Ali here, as he's finally signed for a major promotion after over a decade of hard work on the independents. The 31 year old was determined to make up for lost time, and he brawled with his veteran opponent. The Natural was a little bit too focused on The CTC at ringside, who were a constant threat, and in the end, he didn't see Ali's Uppercut Palm Strike coming. He certainly didn't kick out of the resulting pin! After the match, Solomon Gold ensured the Coast To Coast Connection couldn't put the boots to his mentor, and Sayeed Ali decided that on this occasion, they would let The American Blondes escape without a beating... Ali grabbed a microphone, and from the stage he said that he and his team don't NEED a fourth partner... But that Alex DeColt could 'assign' them one... 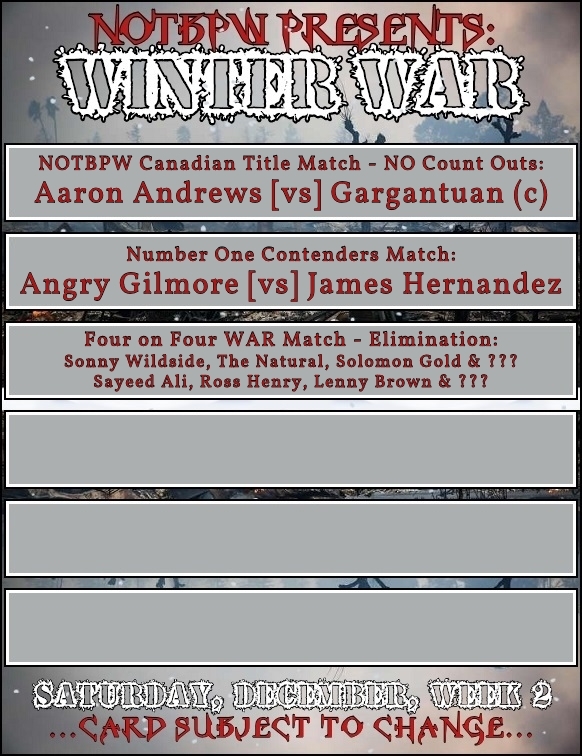 He said that The Natural... Solomon Gold... and even the NOTBPW Television Champion Sonny Wildside don't stand a chance... How can they prepare for the CTC, when they don't even know what the other two members are capable of... they don't even know WHO they are... Suddenly, Sonny Wildside popped up behind the group, and whipped the two remaining masked CTC members' masks off!! Their identity revealed, the two remaining Coast To Coast Connection members were furious, but Sonny Wildside had disappeared through the curtain before they even knew what was happening!! Sayeed Ali calmed his troops down, as the announce team asked questions about his fellow new arrivals... Who were they? Why were they here? Well, to answer the first question, they are 'Rapid' Ross Henry, a former football player who won titles in 2011 and 2012with the Colorado Rapids, but then had to retire in 2014 due to injury... AND 'Bad Bad' Lenny Brown... a youngster from Hollywood California who has a good all-round game... Both men are young, and will be looking to sit under the 'learning tree' of Sayeed Ali!! 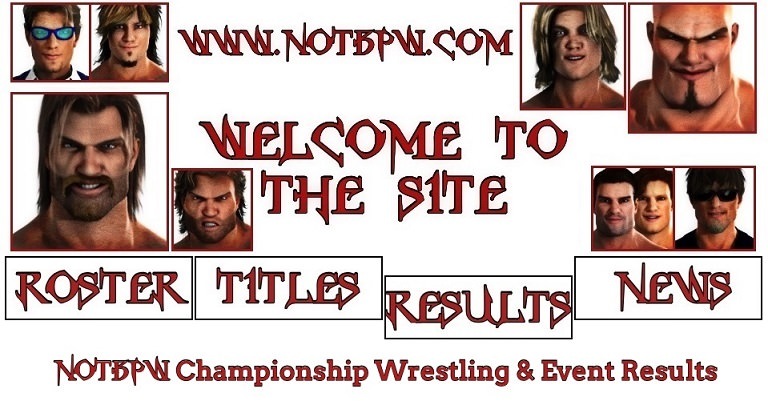 NOTBPW Tag Team Champions: Cameron Vessey and Christian Price headed to the ring next, and called out their rival 'Awesome' Wade Orson!! The young Brit came out onto the stage, but he told Vessey and Price that he would STAY on the stage... A few weeks ago, Orson felt disrespected by Primed For Progress, and threw their bags in the trash... Vessey and Price got revenge, when they tipped white paint into Orson's bag... Orson then took it a step further... setting Vessey and Price's bags on FIRE!! Orson soon realised what was happening here tonight, and he found himself surrounded by Edd Stone, Tim Westybrook and Bryan Vessey!! But he soon got some help too!! Gino Montero and his Brother Luis Montero Jr. have been furious with Logan DeColt's actions in recent weeks, and so Alex DeColt granted Gino this chance to battle Logan 1 on 1 for the very first time. They've met in tag team action before, but tonight Gino was able to get his hands on Logan! The Mexican star put his young opponent away with his brilliant 'Destiny Explosion'. After the match, NOTBPW General Manager Alex DeColt headed to the ring, and told Gino Montero and Luis Montero to stay right where they were... Alex told the Brothers that they have attacked and hurt his son Logan DeColt for the LAST time... He also said that NOTBPW has no room for new families... So next week... Gino Montero and Luis Montero Jr. will go 1 on 1... and the LOSER... Must LEAVE the company, and go back to Mexico!! Gino and Luis didn't know what to do with themselves, as Alex picked Logan up, and helped him to the back... The two brothers seemed to agree to not fight!! A co-Main Event to remember here, as Trent Shaffer came so close to defeating the angry James Hernandez here. 'Mr. Cut Throat' was furious with the referee at one point, as he believed the count was a three, but the referee said Hernandez kicked out at two! Shaffer just couldn't let it go, and it cost him in the end. He berated the referee again late on, and then turned around and walked onto the 'Apparition #14' Spear. No complaints about his shoulders being down for three. The referee could have counted to ten and he wouldn't have kicked out! If Jack DeColt is every looking for an apprentice to take under his wing, he should look no further than Sonny Wildside. Both men are wild, and they brawl in similar ways to one another. Arguably, Wildside prefers to avoid brawls if he can, and relies on his quickness and flashiness. But he couldn't avoid it here, as Jack showed his brutal side at times. Sonny Wildside stood up to Jack though, and showed his potential with a truly fantastic performance. 'Wild Man' Jack DeColt gained a lot of respect for 'The Man Without Fear' for the way he didn't back down, and he took a beating! For the finish, Sonny attempted but missed his 'Fear Factor' Moonsault Stomp, and landed awkwardly as Jack rolled out of the way. Sonny took a couple of moments to compose himself, but then ran in and got hooked and planted by Jack's 'End Of Days' finisher! As soon as the match was over, 'The East Side Assassin' Sayeed Ali, 'Bad Bad' Lenny Brown and 'Rapid' Ross Henry – the group known as the Coast To Coast Connection - headed to the ring, and surrounded the fallen Sonny Wildside for his part in revealing their identity to the world last week, and tonight...!! Jack DeColt decided that he'd like another fight, and he stood alongside Wildside, and got ready for a 3 on 2 brawl!! However, Wildside and Jack soon got some back-up, in the form of two of Wildside's Winter War tag team partners: The Natural and Solomon Gold!! The Natural and Solomon Gold's arrivals scared the Coast To Coast Connection away, and they and Sonny Wildside thanked Jack DeColt for agreeing to stand and fight alongside him... Jack left the ring, and the three fan favourites soaked in the applause and adulation... As they exited the ring though, The Natural was clipped from behind by 'Rapid' Ross Henry, who delivered a devastating chop block which sent the veteran sprawling!! Solomon Gold and Sonny Wildside came to The Natural's aid, helping up onto one foot, and then carried him to the back...!! A brilliant move by the CTC to clip Natural there!! His appearance at Winter War could be in doubt after that one!! BHOTWG have signed up NOTBPW target Bear Bekowski... 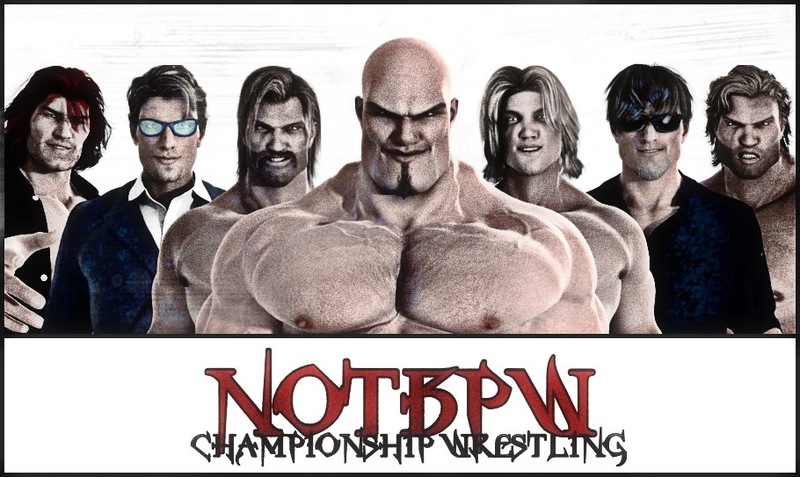 It is believed that NOTBPW never actually offered Bear a contract, they were just keeping an eye on the former RIPW and SWF employee... After spending the entirety of 2016 on the main roster with SWF, he was released in January 2017... Since then, he's made appearances for NYCW, OLLIE, and more regularly for CGC... He's a big loss for the second biggest Canadian company as he now heads off to Japan! Stolen an idea from a diary writer and board member named jesterx7769 . His House Of Stone NOTBPW Diary was fun while it lasted, and I LOVED the graphics in there. He used wrestler pics/gimmicks/catchphrases and nicknames to create what I call 'banners' to break up the segments. I'll be using some of these going forward. Last edited by The Lloyd : 02-28-2019 at 02:19 PM.